My brother was married yesterday to a lovely woman at a beautiful resort in Honolulu. Everything about the day was just perfect, really. After the ceremony we had dinner at a restaurant called La Mer at the Halekulani hotel. The service and food at La Mer were exceptional. In case you are wondering what any of this has to do with wine, I am getting to that — I promise. Wine was not pre-ordered with the dinner as it was not a foregone conclusion that the wedding guests (all 9 of us!) would actually want wine with dinner. 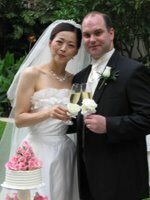 My brother’s now-wife is Japanese and most of her family was in the United States for the first time for the wedding. Although there is big business for Bordeaux and other ultra premium wines in Japan, it is not an integral part of their culture at dinner time, even when compared to the U.S.
My brother seemed very surprised when he asked everyone at the table what they would like to drink and the choice was unanimous – red wine. I saw the sweat slowly creeping across his brow as he looked over the list and so I quietly asked him if he would like some help. The wine list came at me quicker that the waves on Waikiki beach and I knew the decision was now in my hands. There are not many times when I am at a loss with a wine list but this was surely one of them. The list was pricey and full of big powerhouse reds from the Napa Valley, Bordeaux and Priorat. Thankfully for me, the extremely accommodating host at La Mer, himself Taiwanese, discreetly counseled me on the typical Japanese preference for lighter, fruiter reds (I would have asked my new extended family myself but my Japanese language skills are, well, nonexistent.) The maître d' explained to me that there are so many Japanese tourists in Honolulu that he by now knew which bottles generally were sent back and which bottles produced smiles around the table. With his help I was able to pick a winner in a fruity, delicious Zinfandel that acted more like a Pinot Noir with a little muscle. Everyone seemed pleased and, at the very least, the wine accommodated our bowing and “Kampai!” and loosely translated toasts around the table. In the end, I am once again reminded that it is best to carefully consider peoples tastes and not have a “my way or the highway” attitude when it comes to wine. And, besides, Fumiko and David were for certain the focus of the evening, the wine playing its small but vital part in the celebration. Omedetoh Fumiko & David DiDomizio!